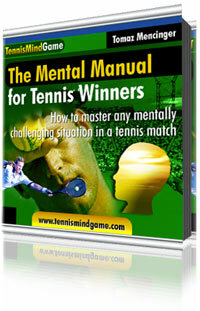 Win Matches - The Quickest Way To Your Improvement! experience less stress on tennis courts. This is the quickest way to improving your game and mental toughness. There are of course no substitutes for hours of practice, gaining experience and improving your strokes. But if you choose only this way, you are not moving forward in the fastest possible way. 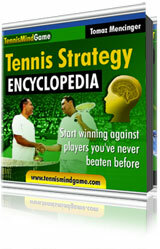 Tennis strategy and mental tips are the only parts of tennis game that you can learn off court. Technique can be practiced without the ball but applying it to the real situation is a diferent story. So is physical preparation impossible to improve by reading something. But your game can change drastically by applying a new strategy, think in a new way or know in advance how to deal with a stressful situation in a tennis match. You can order the ebooks from this page and if you wish to find out more about each one just click on the "More info..." link. The ebooks are in pdf (Adobe Acrobat) format and can be downloaded immediately after the purchase. Buy with confidence from Clickbank, the authorized retailer of The Tennis Strategy Encyclopedia and Mental Manual from Tennis Winners, where your transaction will be handled by a secure server. Clickbank currently sells more than 10,000 digital products online, and the number is growing daily. You also have a 100% risk-free, 90-day money back guarantee on every purchase from TennisMindGame.com. "Start winning matches against players you've never beaten before"
"Master Your Mind In The Most Difficult Situations In A Tennis Match And Start Winning Even Against Your Toughest Rivals!" Best Deal - Order Both Ebooks Together! If you combine the strategies of the Tennis Strategy Encyclopedia and mental tennis tips from Mental Manual for Tennis Winners you will have a complete blueprint on how to play strategically smart tennis and how to overcome mentally challenging situations in a tennis match. This is the best value! Smart tactics and mental toughness will significantly improve your game without changing your technique. Order both books together for a special price of $46 only $37! Additional Bonus: Receive 5 email answers about anything related to tennis – technique, mental toughness, tennis fitness or tennis strategy. That's a $40 value. You will also receive all the downloadable bonuses from both ebooks. I am a club player, and I started playing tennis just five years ago after completing my 50th birthday. Since then I started with tennis classes as well as read many books and watched videos and tennis games. Until now I have never read anything close to what you present in your books. All the instruction provided in both books is so clear and objective that anyone can use those tips and recommendations immediately in the tennis court. I am amazed by the results I am already getting after reading your books. I have not heard of you before (sorry for that) but now, I am sure you are someone who not only loves this game but understands it so well that allows you to put in simple words the secrets of the strategical and mental aspects of this wonderful game. I purchased your books for my son. He plays on a Division I men's tennis team. He has used many of your techniques on the practice court and is now more focused on the court during practice and challenge matches. He has beaten the top players and is gaining more self confidence in his play. I can not thank you enough for writing such wonderful books. They have helped my son tremendously. He knows he has more work to do and the mental conditioning is an ongoing process, but your books, websites and insight has made him feel better about his game.